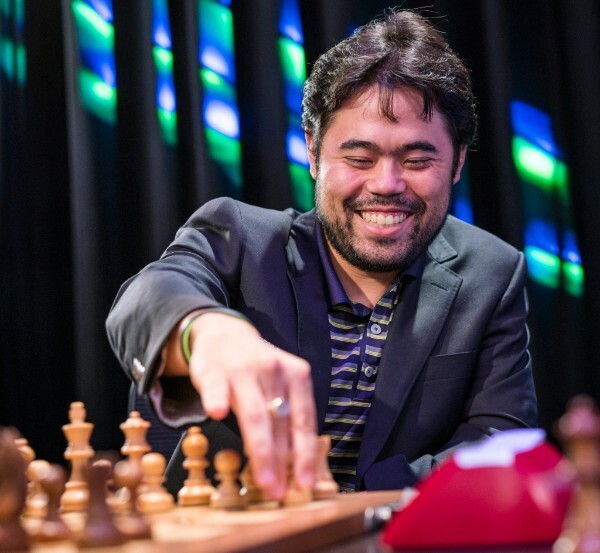 Hikaru Nakamura showed off his nerves of steel today and emerged as the winner of the 2018 Paris Grand Chess Tour. The American is no stranger to the winner’s circle as he has previously won the 2016 edition a full point ahead of Magnus Carlsen. He earned $37,500 and 13 tour points for his efforts. Sergey Karjakin who started the day a point ahead of the field, collapsed during the second half, losing two games and quickly drawing the last one. This was only enough to secure a second-place finish. 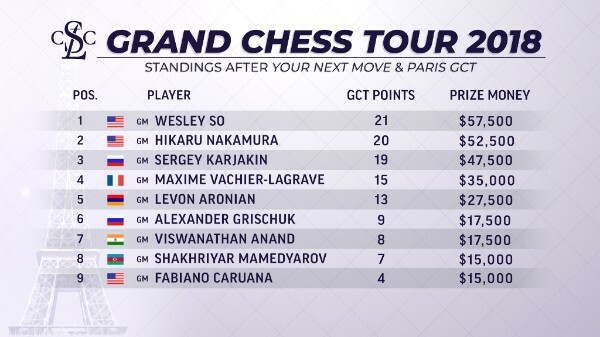 Wesley So finished in third place and is leading the overall Grand Chess Tour with 21 points, while Hikaru Nakamura is in second place with 20 points. Nakamura dominated the day with 6.5/9, winning four games, drawing five with zero losses. Going into the last round he was a full point ahead of Karjakin and only needed a draw against his countryman Fabiano Caruana to secure his first-place finish. There were no friendly draw offers in this game as Nakamura found himself in a lost position. Unbeknown to him, Karjakin’s early draw had secured Nakamura’s first place. He even was able to take advantage of Caruana’s poor form and went on to win the game in the time scramble, reminiscent of Caruana’s own last round win the Candidates when he only needed a draw. Sergey Karjakin remained in the lead until round 15 when he stumbled and lost to Viswanathan Anand, allowing Nakamura to catch up to him. 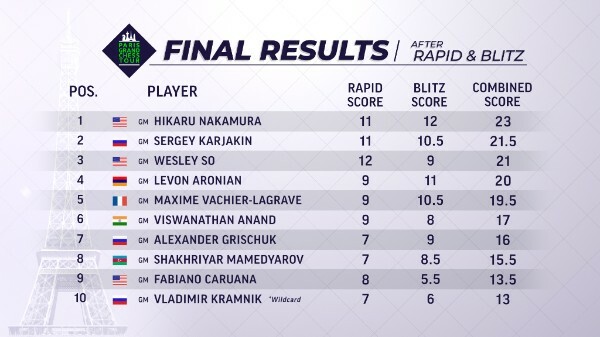 Maxime Vachier-Lagrave made it two losses in a row for Karjakin, relegating him behind Nakamura, an obstacle the Russian was not able to overcome. Whereas yesterday Karjakin showed excellent form, today he was barely escaping with draws in lost positions. His poor form finally caught up to him and he eventually collapsed under pressure. He collected 10 tour points and $25,000. Wesley So did not show a lot of ambition today and drew eight games in a row after winning his first-round game. This result was enough to keep him in the lead in overall tour standings after earning 8 tour points and $20,000. Levon Aronian had an excellent performance with 6/9, only half a point behind Nakamura for the day. Unfortunately, because of his poor showing in the rapid, this was not enough to give him realistic chances of winning the event. He finished in fourth place collecting 7 tour points and $15,000. 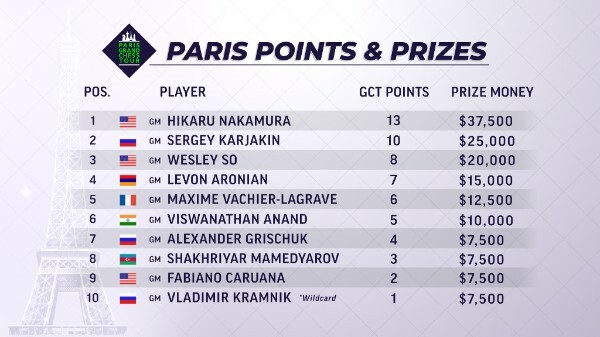 The fifth-place finisher was Parisian Maxime Vachier-Lagrave who collected 6 tour points and $12,500. After a month break, the tour will arrive to Saint Louis in August with the Saint Louis Rapid and Blitz followed by the Sinquefield Cup. As per the regulations, the top four finishers after the Sinquefield Cup will move on to the finals in London where the winner will be decided in a series of matches.